The benefits of canning beer have been covered in the past (see this by Mark Dredge). For me it's important to set cans apart from bottles and that should be done through the way we intend them to be drunk. 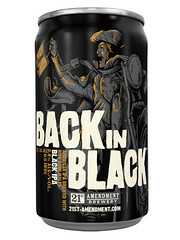 I want to see breweries putting core product in a can; beers intended for everyday drinking. I want to stack up a six pack in the back of my fridge; six cans of a beer I love and that I know I can get whenever I want. That can will be the one I reach for when I'm thirsty and don't want to think, it'll be the one I reach for when I'm packing a picnic and it'll be the one I reach for when taking a few to a mate's. Leave the one-off, super-rare, super-special beers to the grandiose bottle, to the cork and cage. And, most importantly - less is more. If we're ever going to change perceptions of canned beer in this country, 330ml is the only way to go. It instantly draws a line between macro and micro, it’s a sensible volume for higher ABVs and it stands out. Putting the technical considerations aside for a minute (which seem to idicate, as far as I know, that quality wise there is little difference between bottle and cans in terms of quality) I remain to be convinced that it is a good idea in a market where there is a need to raise the reputation and perception of beer, that doing it in a format that is (i think) for most consumers most closely associated with generic products . Format changes can be made to work but it needs a huge effort. The overall move to scewcap in wine needed an entire country (New Zealand) which was on a crest of a wave to convert en masse and supermarkets to demand it en masse and even then it took a good few years to overcome consumer resistance (perception was that screwcap=lower quality). Attempts to move over to quality plastic bottles (environmentally a good thing) have completely floundered. As I say I remain to be convinced but am happy to be so. I know that in the US it works really well but that is a different market with different requirements, needs and demands. You make a good point about the potential damage to reputation amongst the "average" beer drinker though. I think it would be foolish for any brewery to ignore this when considering canning. This is why I think it's so important to draw a line between macro and micro, by selling in 330ml cans you create a product which is instantly unique and distinguishable from current canned beer, yet you still create canned beer. Is it possible that a well branded 300ml can would look like a premium product regardless of it being in a can? Would it be different enough to break any existing association between canned beer and bad beer? I guess there's only really one way to find out. From what I have seen the US has shown that the answer to all these question is yes. Although what is good and what suceeds aren't always the same thing. Hell, I'm writing this form a PC powered by Windows. Leading the way? Leading the way in the wrong direction, perhaps. It's reusable containers that are needed, not disposable cans. Barm: If you look at it from an environmental perspective, perhaps. The topic of beer dispense doesn't begin and end with the environment. Clearly there are other factors to consider. Indeed, that's the only sensible perspective to look at it from. 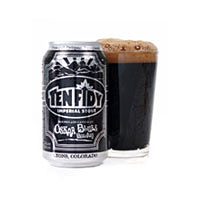 If beer can be good from a plastic cask or a polythene cubitainer, it can be good from a can. But casks and cubes are reusable. Cans only look good vis a vis bottles because the disposable bottle system is broken. If we re-used each bottle 40 or 50 times like the Germans do nobody would be squeaking about cans being better for the environment. Well, for a start it will be interesting to see whether BrewDog actully go ahead with this and to be honest I'm not sure they will (given their history of posturing in the past) but even if they do I can't see any other signifcant micro brewery going with this. Like the so-called "craft keg revolution" that's not about to happen any day soon*, I think the demand for canned micro brewed beer is largely driven by over excited bloggers and a tiny handful of brewers out to make a point rather than anything else. * which may be why Lovibonds are such a "well kept secret" whose beer "doesn't travel very far". Some interesting points re; environmental impact. I like the idea, purely based on experiences I've had with US Craft Cans. But yeah, hadn't thought of the environment angle before. Barm: Could cans offer a method of dispense that's of negligible detriment to the environment? If so, the fact that bottles are even "better" for the environment is largely irrelevant - plus we can benefit from the additional advantages of the can over the bottle. John: A movement has to start somwhere! I agree with you that the drive for canned craft beer is coming from the enthusiastic beer lover and brewer at the moment. However, if that handful of people is right about the benefits, surely it will catch on with the mass market? Lovibonds is still a small brewery in its infancy. I would put their lack of distribution down to that. Out of interest, have you tried their beer? What did you think? A movement does indeed have to start somewhere it's just that I can't see the potential for much, err, movement in this particluar movement. I do think there is a tendency for some bloggers to operate in a bit of a bubble and lose track with what's happening out there in the beer world at large. I can see almost no demand at all for canned Brew Dog beer - apart from the fact that I really can't see who will actually sell the stuff. Where would you expect to find it on sale? Lovibbonds have been around for over five years now - plenty of time to make a mark in the wider world I think. Seems to me their resolute keg only policy may be hindering their business but if they are happy then I guess that is OK. That's the trouble with non-existent revolutions - they kind of get missed by most people (apart from those who think they are doing the revolting, that is). As it happens I have tried a Lovibonds beer - while I'm a CAMRA activist I have enough sense to know that good beer doesn't start and finish with cask - Henley Gold was on sale at a Thornbridge thrash at their Coach & Horses pub last year. It was OK. Was it good enough to make me want another? No. I agree with you about blogging being very insular at times. I'd expect cans to be sold at the same retail locations that bottles are. If you argue that nobody will want to buy a can of IIPA, are you arguing that they don't want the IIPA or that they don't want the can? The market potential for craft beer is a separate question. I genuinely believe that cans could be used to provide a unique selling point for craft beer, that craft beer could distinguish itself from macro beer by using cans as packaging. The additional benefits of cans over bottles would sit on top of that. I agree with you that there are significant factors preventing a movement from really taking off, but that doesn’t stop the potential for something big being there. Unless a brewery or two is able to take the risk and bring a decent canned product to market, I guess we'll never know. As an extra point - thanks for the great comments on this post. Ironically it's one of the entries that took a little less effort, but I appreciate it nonetheless. Interaction, debate and feedback are what make blogging worthwhile. They don't want the can. Completely disagree with you that craft could use cans as a selling point - the main flaw in the argument is that the canned market is already synonymous with macro - canning a beer in the UK would devalue it and not give it any form of cachet or selling point. I really do believe this is a complete non-starter. 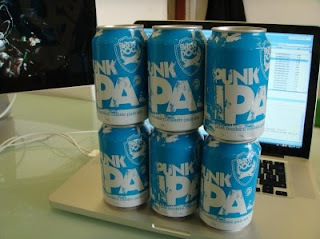 I'm not even convinced that Brew Dog will go down this route (despite what they may be saying at the moment). I guess we'll just have to wait and see what happens. 500ml cans with "traditional" labelling and branding is, yes. I agree. But I'm talking about 330ml cans with modern, "craft" branding. They would definetly stand out against the cans you see today. I don't think that "craft branding" has anything to do with it. Regardless of can size (and I don't think all macor beer is in 500ml cans is it?) it is the concept tof the can that is devalued as far as UK beer goes. I realy do think that the "craft cans" concept is something that is only alive and well in the beer bloggers bubble. You say that "craft cans" would be sold in the same outlets as "cratf bottles". Well apart from a handful of specialist beer shops, that means the supermarket trade (and let's face it even Brew Dog have gone after that) and as I'm sure you know they have one range for the bottles and another for the cans. So even if they had "craft branding" such cans would be positioned with the crap and so be devalued at a stroke. Anyway this is all hypotheticla because I tell you it just ain't gonna happen.